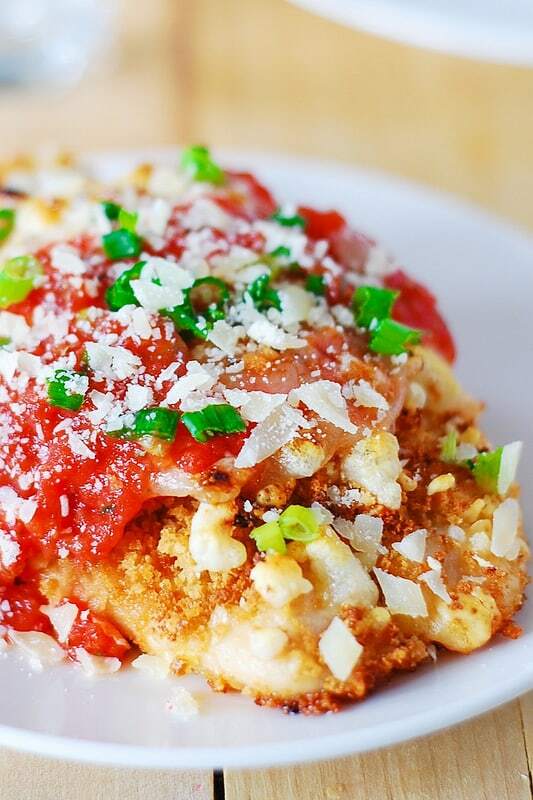 Baked Chicken Parmesan – skinless, boneless chicken breast is coated in bread crumbs, minced garlic and shredded Parmesan cheese and baked in the oven with the marinara sauce and Mozzarella cheese. 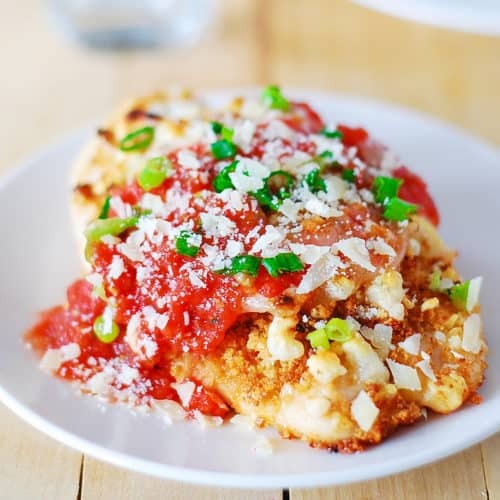 If you want an easy and delicious recipe for boneless, skinless chicken breasts – this baked chicken Parmesan is definitely a great option! I love recipes where baking the chicken actually makes it juicier, more flavorful and crispier than frying it! This is one of those recipes. The chicken is moist and tender with a crispy and crunchy top! 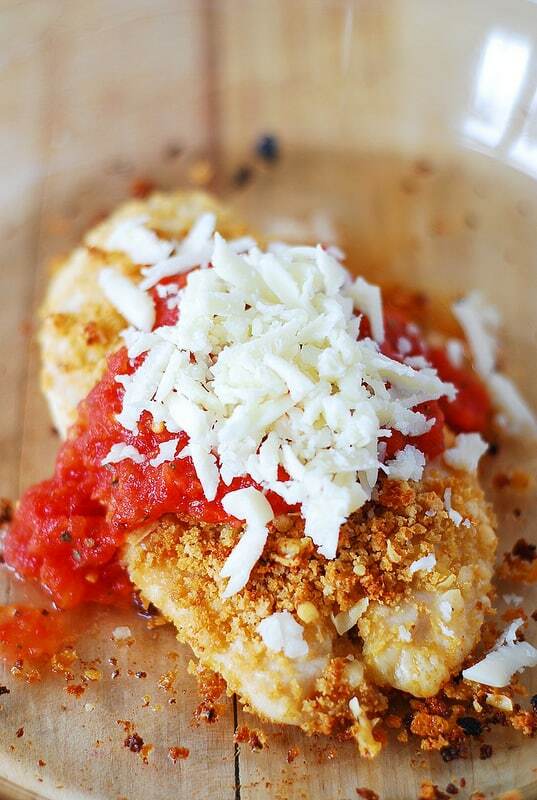 This Baked Chicken Parmesan is so versatile. You can serve it with a salad and a garlic bread on the side, over a bed of linguine with some extra marinara sauce; over spaghetti squash or real spaghetti, over some ravioli, etc. 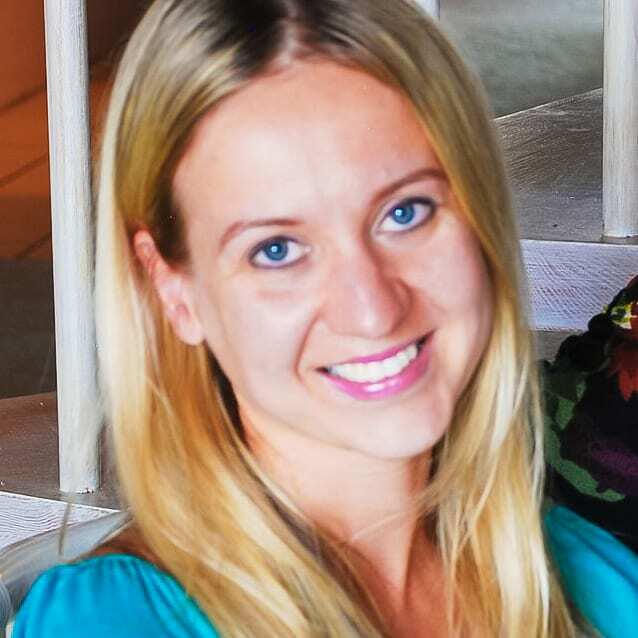 – whatever comes to your mind or whatever suites your dietary guidelines! Despite the name of the dish (which makes a lot of people think that it’s a complicated recipe), chicken Parmesan is actually quite easy to make. You don’t even have to prepare your own marinara sauce because there are plenty of high quality options in the stores these days. But, if you’re a purist, you can make your own homemade marinara sauce. First coat the chicken with olive oil, salt & pepper, then roll it in Panko breadcrumbs, together with some minced garlic and finely grated Parmesan cheese. Bake the chicken for about 20 minutes until it’s cooked through, bounces back when pressed and is no longer pink in the center and to achieve the desired crispy top. Next, top with shredded Mozzarella cheese and bake for 10 more minutes – just until the cheese melts. It’s done! 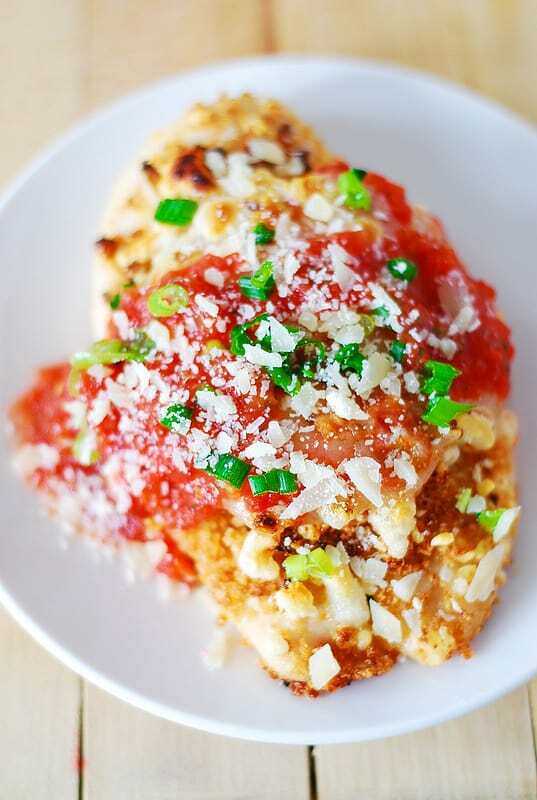 Top your baked chicken with finely grated Parmesan cheese and finely chopped green onions! I’ll repeat myself here, but the serving options are endless: with a salad and a garlic bread on the side, over a bed of linguine with some extra marinara sauce; over spaghetti squash or real spaghetti, over some ravioli, etc. – whatever comes to your mind or whatever suites your dietary guidelines! 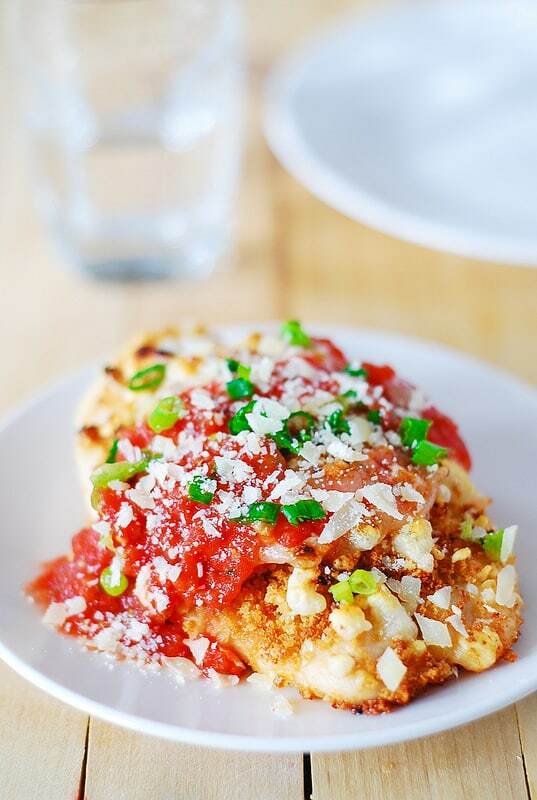 Baked Chicken Parmesan - skinless, boneless chicken breast is coated in bread crumbs, minced garlic and shredded Parmesan cheese and baked in the oven with the marinara sauce and Mozzarella cheese. Preheat oven to 425 Fahrenheit. Spray a baking dish or baking sheet with olive oil spray. Coat chicken breasts in olive oil. Season chicken breasts with salt and pepper, to your taste. Combine 1/2 cup bread crumbs and 1/4 cup finely shredded Parmesan cheese - Roll each chicken breast in this bread-cheese mixture. Combine minced garlic with the remaining shredded cheese and press this mixture on top of each cutlet, pressing lightly to adhere. Bake for about 20 minutes, remove from oven, put 1/4 cup of marinara sauce over each breast, top with the desired amount of mozzarella cheese. 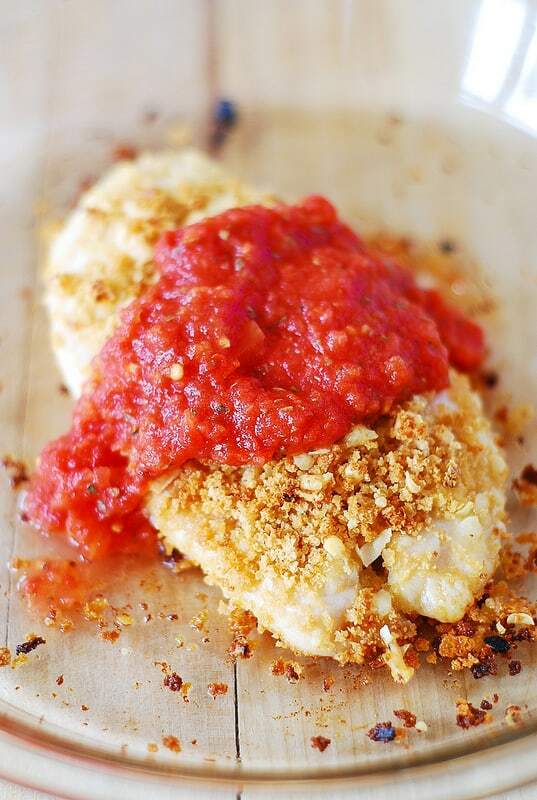 When putting marinara sauce over the breasts, do not cover 100% of the breast, just a small center portion - that way your chicken will still be super crunchy and crusty in the sections where it's not covered with the marinara sauce (see my photos). Return to oven and continue baking for about 10 more minutes, until chicken bounces back when pressed, is no longer pink and juices run clear, and until cheese is melted. You can even use a broiler for this step - but be very careful and watch the chicken to make sure the cheese doesn't burn. Garnish with finely grated Parmesan cheese and finely chopped green onions.